Argentinean musician, Gustavo Cerati, who became popular in Latin America as the lead singer and guitar player of the band Soda Stereo, suffered a stroke caused by cerebrovascular disease after performing a show in the city of Caracas, Venezuela on May 15. The musician had surgery, and is currently in a coma. After his condition became public, Twitter became one of the means of circulation of news and rumors about the musician. The hashtag #cerati became one of the most popular worldwide, and others such as #fuerzacerati (stay strong Cerati) also came up in local versions of hashtags rankings. 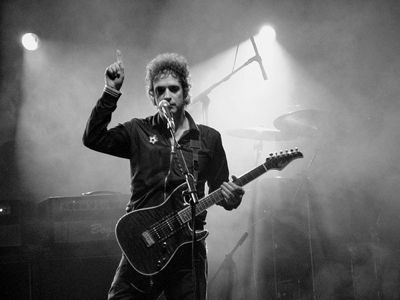 Photo of Gustavo Cerati by annais and used under a Creative Commons license. sigo orando por @cerati mandandole la mejor energia y mucha fuerza!!! I'm still praying for @cerati sending him the best energy and strength!! There was also a lot of room for rumors. At times, talk about the death of the singer came up, something that was quickly denied in the media. However, many journalists from traditional media published news about Cerati's health condition through their Twitter updates. In the case of blogs, something curious happened. Before the death of the popular Argentinean singer, Sandro, Clarin newspaper, the most popular in Argentina, published a special issue [es] on its website they had prepared in case he died, something that happened weeks later. We need to take into consideration that it's normal for the media to prepare obituaries of people who are in risk of dying as a way of planning the publishing of content. Since that event, the blog UDN [es] published an entry where, by using an images editor, they created a fake cover of Clarin's Showbiz section, that read “goodbye Cerati”. The image spread through Twitter, where some users took it seriously and believed it was another Clarin leak. Hours later, the newspaper reported “actions” against them [es]. While the blog that published the “fake cover” maintains a pro-government position and against Clarin newspaper, it is also true that the entry made it clear it was a joke, and not a leak of Clarin newspaper's material.